Soulful, mesmerising and smooth are just a few of the words that describe her inimitable voice. With a repertoire that spans reggae, soulful house, neo-soul and jazz, BASHIYRA has an ability to captivate, move and entertain diverse audiences. Her appointment as a live performer for the ‘London 2012 Paralympics Opening Ceremony’ in August 2012 and the subsequent personal thank you letter from Mr David Cameron, UK Prime Minister is further evidence of the authentic creative credence, this talented woman conveys. 2009 saw the release of her refreshing debut, Thought You Knew, a balanced mix of neo-soul, jazz and dance harnessed by her rich, soulful and emotive voice. This successful self-release led to BASHIYRA receiving The Soul Baby Live Award 2011. In the same year, Black Women in the Arts awarded BASHIYRA The Nina Simone Award for her outstanding work in the area of jazz. Black Women In The Arts (BWA) was established in November 1995 by female artistes; having an intention to support and promote the artistic endeavours of female artists from the African and African Caribbean communities. In association with The Dalston People’s Festival an initiative of Hackney Unites http://www.hackneyunites.org.uk a festival for the diverse people and communities of Dalston. We will witness a vision that is rapidly taking shape; the conceptualisation, that there will be a bringing together of communities through, music, arts, and fun….. This will break down some barriers and begin to explore what ‘the people’ have in common, and how our neighbourhoods can be improved and have peace and progression for all. Black Women In The Arts (BWA) has invited the soulful voice of BASHIYRA to utilise a creative opportunity extended upon them within the dynamic framework of The Dalston People’s Festival. With the release of her sophomore album ‘Independent‘ and a new EP being imminent this year, BASHIYRA established this platform to perform new songs via an acoustic based pre-launch, setting the tone for the full orchestral launch later this year. ‘Independent’, is sure to deliver more chart-climbers and accolades produced by Herb Middleton where BASHIYRA will write with Crystal Johnston (who has written for Mariah Carey, Jennifer Hudson, Anthony Hamilton and Angie Stone) and Richard Rudolph (who co-wrote the Minnie Riperton classic Lovin’ You). At the acoustic pre-launch listeners can witness for the first time new unheard material taken directly from the new album and EP ahead of its official full release. BASHIYRA will be joined by Wayne Brown on piano (Earth Wind and Fire/Ruby Turner) with guest support via Onita Boone, a New York native and Germany based singer who is also the 2012 recipient of “The Winner Is”, Germany’s equivalent to Britain’s X-Factor, where she won a cheque for a million pounds via a deal with Universal Records. From the UK will be Xenia (a voice student of BASHIYRA) who will make her first formal singing appearance. However Xenia is no stranger to the stage, being a dancer by first profession who is the team captain of the England Dance Squad and the musical theatre troupe. 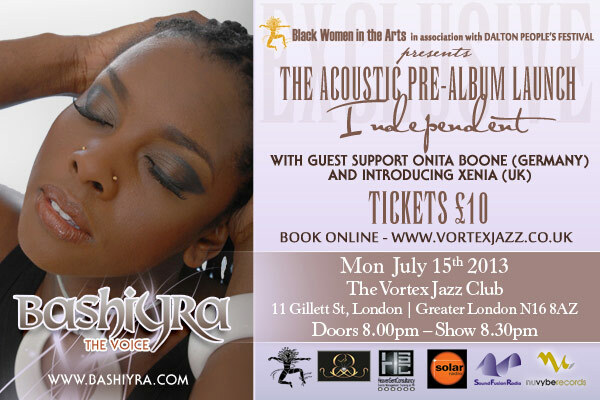 July 15th 2013 is an exclusive event taking place at The Vortex Jazz Club, based right in the heart and soul of The Dalston People’s Festival, which will take place over a week from July 13th to 20th; showing BASHIYRA’s support of the arts and its influence in bringing unity to the community. A unique event to be experienced and enjoyed by one and all. “BASHIYRA has the vocal power of a lion with the sweetness of a canary, a true rare find! The Voice is The Voice”…. Having performed backing vocals for music industry heavyweights such as Patti Labelle, Michael Bolton, Diana Ross and Queen, world record holder, multiple award winner and Independent Singer and Songwriter BASHIYRA brings a wealth of captivating artistry to the industry.